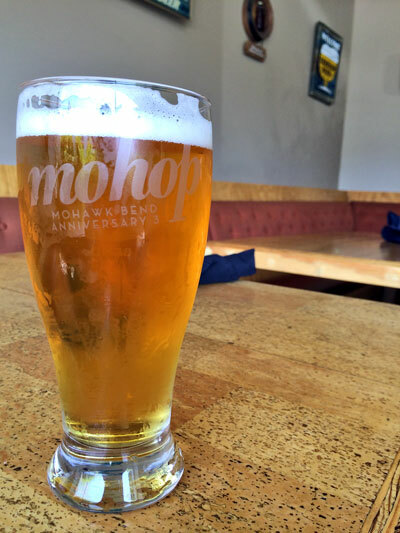 As you might have seen, this month is Mohawk Bend‘s 3rd anniversary and they are celebrating all month long with special beer to commemorate the occasion. Last year for their 2nd anniversary they created One Hundred & Two, a Belgian style blonde ale with a big citrus presence and a whopping 8.8% ABV. This year they went a very different direction, crafting an India pale lager named MoHop that has a big dose of Southern Hemisphere hops and a more moderate 6.5% ABV. Though not a traditionally accepted style, the IPL has been around for almost a decade. The gist of the style is to take a lager and hop it up using hops that would traditionally be used for IPAs. This yeast switch is meant to help create a lighter, cleaner body that highlights the subtleties of the hops that are sometimes lost in their ale counterparts. This style has also been called a hoppy lager or American pale lager. In this case, the gang from Mohawk Bend teamed up with Golden Road Brewing and decided to go with a blend of some of the Southern Hemisphere’s hottest hops at the moment, Mosaic, Motueka, and Equinox, to give their lager a big punch of fruity hop flavors. The beer pours a clear golden color with a good compliment of bubbly white head. The aroma is very hoppy with notes of citrus, guava, and subtle biscuit malt. The flavor follows the nose with a burst of citrus and fruity flavors with a distinctive lager crispness that allows for the hop notes to really flourish. The finish has a nice amount of lingering fruitiness with just a bit of hoppy bitterness, but not as dry as an IPA would be. This beer’s a great example of the hoppy lager style and a great place to start if you haven’t explored the non-traditional lager side of things much. Sadly this is beer will only be available for a limited time, as once the kegs kick it will (most likely) be gone forever. So if you are interested in trying this beer, make your way to Mohawk Bend in Echo Park and give it a shot.